R.P. 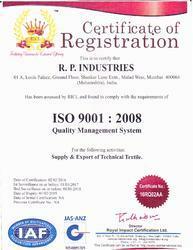 Industries, an ISO 9001:2008 Certified Company by JAS-ANZ, was established in the year 1979 in Mumbai, INDIA. We are a prominent manufacturer, supplier and exporters of a comprehensive range of technical fabric and industrial yarn in INDIA. Fabrics and yarns provided by us are highly acclaimed for their quality and customization in the required price range under one roof. Our aim is to serve our clients with wide range of fabrics and hence we provide around 800 different types of Technical Fabrics in Polyester, Nylon, Cotton, PC, RFL Coated Fabrics, Dipped Fabrics, Stretchable Fabrics, Fiber Glass, Aramide, Felt, Geo Textile, Filter and Dust Collector Fabrics etc. This has helped us in establishing a strong foothold in many Industries like Rubber, Automobile, Energy, Infrastructure and Pharmaceutical etc. R.P. 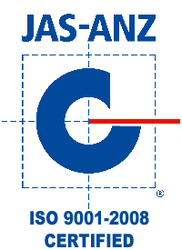 INDUSTRIES is an ISO 9001:2008 Certified Company by JAS-ANZ. We have a capacious warehouse that enables us to store a large amount of our range of products. We keep all our stocks in the separate section of the warehouse. Our responsible warehouse managers ensure that the finished as well as raw materials is kept safe from any type of climatic and accidental damages. Our warehouse is segregated into different sections that helps in accommodating various range of our products. Future is in our hands so why not make it better. Our clients form the fulcrum of our existence and we take all decisions keeping their interests in consideration. As a result of our client friendly approach, competitive prices and timely delivery mechanism, we have established a strong foothold in the Technical Fabric Industry. Not only have our products received accolades from the domestic clients, they have won rave reviews from international clients as well. We regularly export to Europe, North America, and many other regions across the globe. We are an accomplished manufacturer, domestic supplier and exporter of a comprehensive range of high quality Technical Fabrics. Technical Fabrics are available in both in standard and customized types, as per customer specifications. Known for their numerous high end features and competitive prices, Technical Fabrics are used in a number of commercial and industrial applications. All these professionals work in close sync with each other in order to smoothen the production and other related processes. 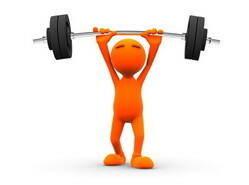 Our professionals also undergo skill enhancing training to keep them abreast with latest developments in the industry. It is through the constant efforts of our professionals that we have been able to cater to the demands of our valuable customers based across the national and international markets. Experience in Technical Textiles since 1979 and thus offering customized practical and economic solutions to our esteemed customers. Safe and prompt delivery irrespective of the location-our utmost priority. Superior quality raw material in the fabrics. 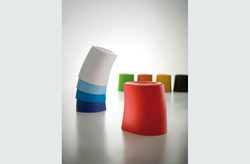 Customized products as per the Clients requirements. Sound business practices and customer centric approach. For Conducting Trial production, small quantity is also available. Customer feedback is given primary importance. Long list of satisfied customers from all across the world. We are preferred by the clients for our wide range under one roof EX Stock. Due to Inventory Control and extensive product range, customers prefer to procure required quantity and quality of fabric readily available from us. Experience in this Field, established since 1979 and offering customized, practical and economic solutions to our esteemed customers for their innumerable requirements. Superior quality raw material used in the fabrics.